You haven’t “done” Europe until you’ve acquainted yourself with its two most influential cities. In London, you’ll see everything from Buckingham Palace to the bustling streets of Soho. Paris is only a short train ride away. In the French capital, you’ll take a trip up the Eiffel Tower and explore beautiful areas like Le Marais and Montmartre. You’ll also be able to taste the great cuisine. Breakfast at The Wolseley and afternoon tea at The Savoy are a must. When you arrive at the airport your driver will meet you and take you to your hotel. When you’ve settled in you’ll head for rooftop drinks at The Rumpus Room Bar overlooking The South Bank and Saint Paul’s. This bar has one of the best rooftop views in London. 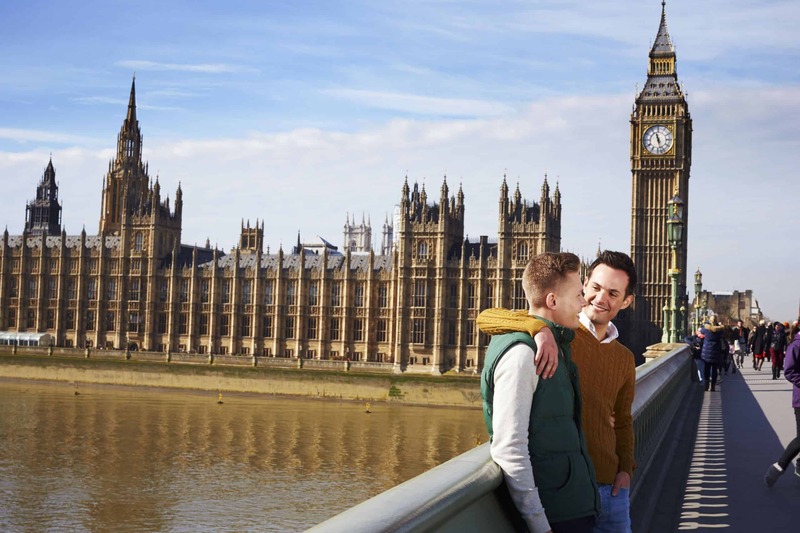 Take a walk along the Southbank, cross Millennium Bridge and enjoy a meal in the centre of town. This morning you’ll take a trip to Buckingham Palace where you’ll see the Changing of the Guards. Take a walk up The Mall to Trafalgar Square and visit the National Portrait Gallery. Here you’ll see the great, the good and the bad of British history. Enjoy afternoon tea at The Savoy. Wake up bright and early for breakfast at The Wolseley, and then enjoy a stroll around some of the fabulous shops in Mayfair. In the afternoon you’ll take a guided tour of the Tower Of London. If you’re a fan of history don’t miss the British Museum. You may alternatively wish to head to South Kensington to see the V & A Museum, the world’s leading museum of decorative art and design. 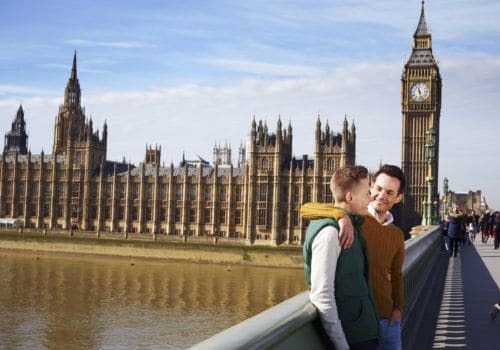 In the evening a private night tsar will take you on a tour of Soho, where you’ll see some London’s best gay nightlife. From gay Soho to gay Paris. Head to King’s Cross St Pancras and take the Eurostar to Paris. A private driver will meet you and take you to your hotel. When you’ve settled in head to Place Concorde and take a trip up the Eiffel Tower. It’ll then be time to take a nighttime guided tour of The Louvre. After that your head will be brimming with culture so you’ll need a drink and some food. Take a stroll along the Champs-Elysees and dine at Laurent, the former hunting lodge of Louis XIV. Take a trip to Notre Dame, the iconic Medieval Cathedral in central Paris located right by the River Seine. Take a look inside and acquaint yourself with one of France’s most famous buildings. Then, if you’re a book lover, head across the river and take a look around Shakespeare & Co – one of Europe’s best-loved bookshops. From here you’re just a short walk from the Latin Quarter where you could enjoy a crepe and a drink. Head to Le Marais where you’ll find stunning architecture, great international cuisine and many gay bars and shops. If you like falafel you’ll do well here. Take a trip to Rue Pigalle and head up the famous stairs to Montmartre – there’s if lift if you’d prefer not to walk. Montmartre is one of the most charming parts of Paris. Many scenes from the film Amelie were filmed here. Explore the winding streets, see the former home of grand diva Dalida and explore Sacre Coeur. There’s no shortage of fabulous shops, bars and restaurants. 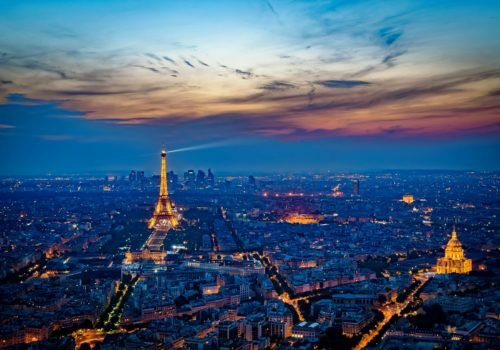 At night the panoramic views of Paris are particularly eye-catching. Your driver will collect you from your hotel and drive you to the airport for your return flight.